Dallas photographer Randy Stewart visits with Dallas based artist Ross von Rossenberg By Randy Stewart (Photography by Randy Stewart – www.NoPhotosAllowed.com) May 16, 2015 I recently had the opportunity to visit with and photograph Dallas based artist Ross von Rosenberg. As part of a photo project with people at work, creating beautiful art, this photo shoot certainly captured the creative spirit in action. I first learned of Ross through the Kettle Art Gallery in Deep Ellum - Dallas, TX. With no contact information for Ross at the Gallery site, I Googled him to find quite a few reviews. Still no contact information until suddenly a FaceBook mention, search, and there he was. Figuring here goes nothing I sent him a message on his FaceBook page. Well, he responded expressing interest in the idea of photographing him during the creative process. A couple of phone calls later, we set a date and time and I couldn't be happier with the outcome. When I noted his address, it sounded awfully familiar but still entered information into MapQuest for exact directions. Turned out he lived 1.5 miles from me. Yes, literally three lights down the street. Something about that Six Degrees of Separation and bits about what a small world it can be. Ross and his beautiful fiancé Lauren welcomed me into their home following a long day at the office for us all. We were all genuinely pleased to meet one another for the first time and had a nice first visit. During our conversation I discovered Lauren is an artist as well! Perhaps she’ll afford me the opportunity to visit with her and her art someday. Her most recent piece was a beautiful painting ready to change any wall and interior. This visit was a great opportunity, I know for a fact, as some artist are not open to the idea of being photographed at work on their masterpiece projects. Not having met Ross or his fiancé Lauren, I didn’t know what to expect. Having known a few artists along the way, I’ve come to know some very interesting and quirky personalities. Turned out I couldn’t of met a nicer down to earth, intelligent, and very talented couple. Had an opportunity to view a few of their own creations which adorned the living room area. Really fantastic work. While most homes sport works by other artists, they had their own work beautifying their walls. Surrounded by the art and painter’s tools, the two were in their element away from their daytime office endeavors. Living in the Uptown and Arts District of Dallas I have plenty of art forms to feast my eyes on. However, rare is the opportunity to see any of the artist at work while they create the beautiful pieces. Today’s visit would be different. Not being a qualified art critic, I can only describe a couple of the pieces as reminiscent of Dali with a touch of modern and seemingly abstract imagery. Upon closer inspection those abstract lines evolved into concrete imagery where I could see the the face or human figure alongside seemingly concrete shapes and forms. Visual painted corridors within my own mind leading me on and on as a living experience continued and wrapped about the canvas edge. Among other galleries and art exhibits, Ross has had art displayed and represented in the Dallas WAAS Gallery with it’s significant artists from local and international markets. View samples of his painting, illustration, sculptural, and digital works at his website link below. 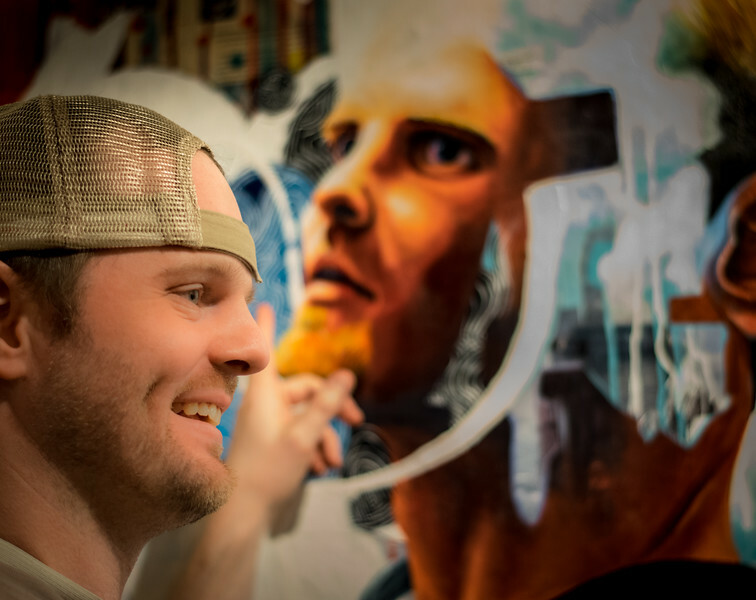 Whether it was his painted Steinway piano as part of Art Basel week exhibit, the Deep Ellum Arts Festival, or his Four piece Hemingway vignette, and other painted canvas within local galleries, he’s a fantastic artist! Ross was nearing the completion of his latest painting pictured in this photo set. Up to this point he had worked on the piece many days with occasional breaks and today he was to finish up and sign off on the piece. He hadn’t named the painting but mentioned he’s been inspired by songs while naming other works. Very pleased with the outcome of this set. Good camera art capturing the artist creating their own art. Feel free to visit Ross at the links below and explore his talent. He may be the right fit for the one of a kind commissioned piece! PHOTO1: ARTIST ROSS VON ROSENBERG DESCRIBES THE STORY BEHIND A SELF PORTRAIT DONE FOR HIS SERIES TITLED ISLENSKA. THE SERIES WAS DISPLAYED AS PART OF “ALIVE” AT WAAS GALLERY ON MARCH 8TH 2014.